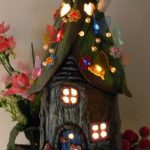 How To Make A Fairy House Lamp | DIY projects for everyone! I woke up one Saturday with no plans for the day. Whilst drinking my morning coffee and going through Facebook, I saw a picture of a man making his daughter a fairy house from a log with a chainsaw. I thought, that would be perfect for my daughter’s 8th birthday present. I jumped on gumtree.com and found hollow logs for sale not far from home. I went out almost immediately, picked three beautiful logs and then spent the next two days cleaning one of them up with the Dremel. I had an idea that I wanted a window and a door, so I used a drill with hole cutter bit to randomly cut shapes. I also used a few different sized drill bits to randomly make holes, knowing that light would only really escape from these gaps. I mounted it on polystyrene shapes from spotlight which I glued together and cut out space for the underneath mechanics of the lamp baton. I cut a piece of plywood to secure the lamp holder in place and glued it to the polystyrene. I then carefully sculpted out a recess for the timber to comfortably sit inside of it and not wobble or move. I drilled a hole through the polystyrene at the side for the chord to poke out. It was time to switch it on to get inspiration! I knew I wanted stairs up a hill to the front door, so I set about carving the polystyrene in to a rough shape and then plastering it over the top. Placing the stones in formation was incredibly difficult but I eventually got them in place and lightly plastered them to stay. My daughter is fascinated by some of the crystals and stones I’ve collected over the years so I thought I’d incorporate them into this special sculpture for her. Next was to make the full size landscape base. I wanted the stairs to lead down a path to a pond so I made sure I left a ‘well’ shaped hole. I also had the idea to put in a real bonsai tree so I left a circle shaped hole for a pot to go into. After plastering the shape, I used airdry clay to clean the rough plastering up and give me a more defined shape to work with. I plastered in the stones for the path. Once the airdry clay was dry, it was time to start decorating. I started by painting dirt and rock-coloured browns and blacks…. I used less catalyst so it would go off slowly. This allowed me to stir in a blue tint and the ever important fairy dust (ground up aluminium). When it started going hard I balanced the lilies on top. I used little sticks as ‘logs’ and painted them with the resin so they looked wet. Once it had set, I was able to use the moss matting I had bought online. I cut it to shape and glued on to plaster. I also glued in bigger pieces of moss I had bought from Spotlight for variation. Next I knew I wanted a bridge over the pond so I had saved a nice round piece of timber that I had chopped off the bottom of the log to make it flat. I polished it up and glued it in place and then super glued sticks along each side. I started to glue stones around it for steps. The next step was to start sorting out the roof of the house/lampshade. I got some clear plastic and cut it to shape, rolling it around. I then got a toilet roll and glued stones to it for a chimney. I secured the to the plastic. I bought fake branches with leaves from Spotlight and cut the leaves off and cut them in half. I hot glued them on to the plastic and around the chimney. I also got some sculpey and crafted the top of the chimney from that and glued it in place. 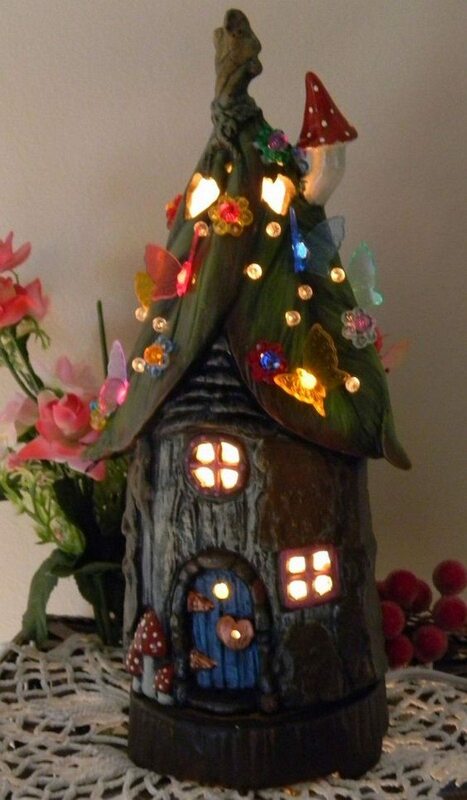 Next, my daughter had previously mentioned fairy houses had circles on top of their roof. Not knowing what she meant, I set about making a circular shape for her using wire. I bought a ring from Spotlight and attached 8 (I think) long bits of wire. I shaped them and then spent time making cross sections and sticking them together for stability. I hot glued it to the existing form, ready to paper maché. Now that this shape was ready for leaves, I knew I wanted more on the bottom to stick out and act as pergolas etc so I added wire shapes here. At this point I knew I needed the bonsai to be custom made, so I went and saw a friend who is an expert. He took an existing plastic pot and sat it in the existing hole I had left. We then roughly drew the landscape shape around the pot and cut it down to size so it would fit in the hole and not be seen. He then planted and shaped the foliage for me. I decided I wanted a balcony out the side so got a bag of Icypole sticks. I made a cardboard template of the rough shape but spent a lot of time getting the inside shape right. I knew it was going to sit next to the house and I wanted it to sit flush. I took my template and sticks on top, glued them together with craft glue and used sharp scissors to cut it all in to shape. I glued it to the plaster edge I had left myself and then hot glued sticks from the bottom to the ground for structural support. I then hand painted the creamy white sticks to look like darker timber. I then added sticks, string and beads I had bought from Spotlight. And added heaps of moss everywhere with craft/wood glue and fake moss. I bent the fence to follow the contours of my landscape and hot glued it in. I got plastic filing folders from Officeworks. I bought three of them in purple (my daughter’s favourite colour) and cut them to shape so they would roll up inside the wood and add colour to the light. I bought little flowers and stick on gem stones from spotlight to finish embellishing it. I also got a round offcut, glued it on for the verandah and glued in two posts. I then sculpted the front door out of sculpey and glued it in, leaving it slightly open to let light out and make it look inviting… I glued a bead on for the door handle. Previous articleBuild a bench around a tree using kitchen chairs!